Are you addicted to the immense highs and enraging lows of multiplayer gaming? Diep.io is an extremely satisfying (and occasionally heartbreaking) game of tank warfare. Inspired by Agar.io, Slither.io, and all of the other .io games, Diep.io seems to have perfected the format. It’s fast, easy to learn, and challenging for veterans and novices alike. Diep.io pits player-controlled tanks against each other. There are no AI opponents, and every gamer has the same mission: kill to become the strongest. This is very similar to Agar.io, in which players must consume others to grow. In Slither.io, snakes trap each other and feast upon the dead for power. Well, there are no teams in Diep.io. It’s every person for themselves, and there’s nowhere to hide. The always-visible scoreboard is a constant reminder of how many others you must kill to rise through the ranks. Without seeing the game on Poki portal, Diep.io might sound like a regular FPS deathmatch; this could not be further from the truth. Diep.io is built for browsers and mobile devices. It isn’t weighed down by processor-hogging graphics, complex animations, or a cutscene-laden storyline. Diep.io is a simple as it gets: the battlefield is a gray grid, and everything within it is two-dimensional. Players’ tanks are cyan circles with flat turrets, bullets are red, and all environmental targets are basic shapes. As a result of avoiding complexities, everything moves smoothly. Whether you are traveling across a clear path or in the heat of a hectic battle, the game doesn’t speed up or slow down. The consistent frame rate keeps you in the mindset of war, even though you’re just looking at simple shapes on a flat background. Unlike its predecessors, Diep.io features a rather deep upgrade and leveling system. In the bottom-left corner of the screen, an upgrade menu appears when new choices are available. After blasting enough targets, players can acquire additional health, stronger bullets, and permanent speed boosts. Each upgrade has many levels, allowing gamers to choose exactly how they want to modify their tank. If you want to zoom across the battlefield faster than anyone else, you can. But, that comes at the cost of potentially ignoring other upgrades, such as ammo penetration and damage. Only the most lethal tanks can afford every stat boost. If you want to be the best, you have to earn it. Stat upgrades aren’t the only way to gain an advantage in battle. 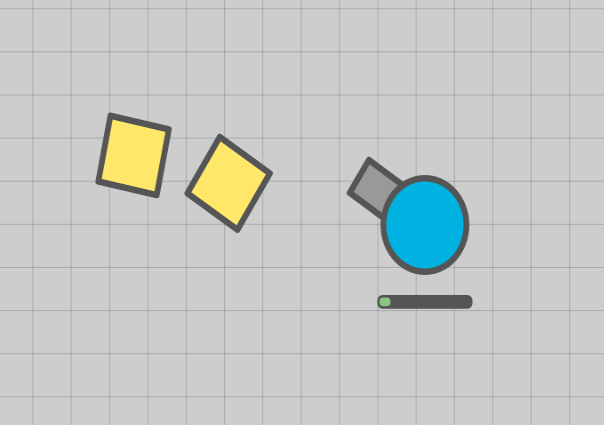 Diep.io is chock-full of different tank classes and turrets. If you like shooting bursts of ammo in one direction, try upgrading a Twin into a Pentashot. For slow-but-deadly cannonballs, look to take advantage of the Mega Destroyer. Diep.io is a relatively new game, and updates are rolling out quite consistently. As new tank classes become available, players’ strategies must change. If you haven’t gotten in on the action yet, now is a great time to play. Diep.io is a well-developed improvement over the older .io games. And it’s getting better with every update.